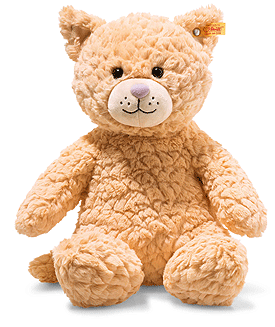 Steiff Whiskers Cat is made by hand, in the finest apricot cuddly soft plush. Meet the extraordinarily lovable Whiskers cat. Her apricot-coloured plush fabric shines in the sun. Her smiling mouth and the whiskers have been stitched in black. To go along with her cute little pink nose. Her inner ears and mouth area feature a light orange contrast. The bean bags sewn into her bottom, paws and soles give her good support. At only 38 cm, she is very easy to wrap your arms around. Also available in grey.